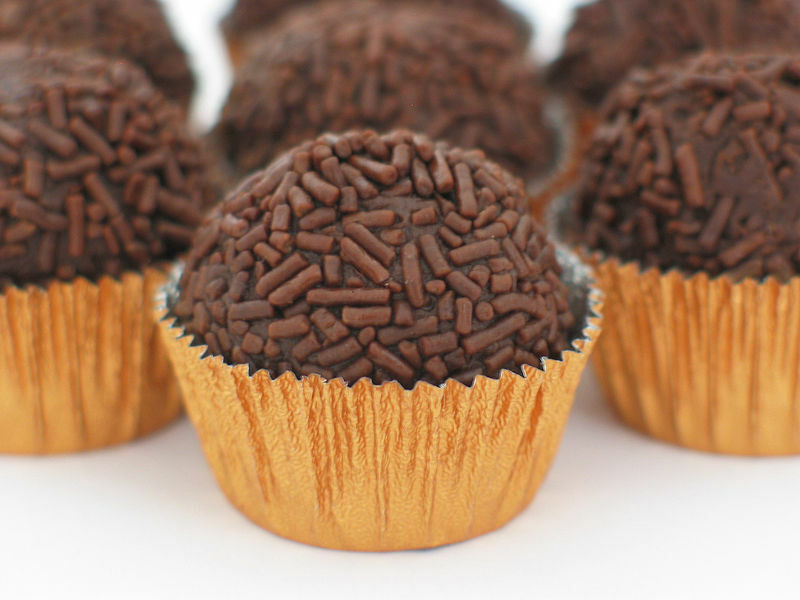 Brigadeiro (Portuguese for Brigadier) is a simple Brazilian chocolate candy created in the 1940s, and named after Brigadier Eduardo Gomes, a famous Brazilian politician, and its shape is reminiscent of that of some varieties of chocolate truffles. Left: Brigadeiro, national candy of Brazil. This candy comes from Brazil but has traveled far and wide. It is very popular in Spain, Brazil, Chile, and Portugal. The candy is usually served at parties and is very popular among both children and adults. It is made by mixing sweetened condensed milk, butter and cocoa powder together. The mixture is then heated in a pan on the stove or in a microwave oven to obtain a smooth, sticky texture. If made on the stove, it is ready when the mixture doesn't stick to the bottom when the pan is tilted. The candy is then rolled into balls which are covered in granulated chocolate.